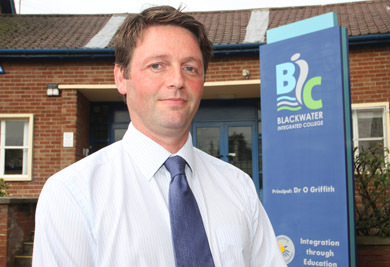 Stephen Taylor, the new vice principal at Blackwater Integrated College in Downpatrick. Blackwater Integrated College is pleased to announce the appointment of Mr Stephen Taylor to the position of Vice Principal, commencing in the 2013-2014 school year. Mr Taylor has been with the College since its inception in 2008. Mr Taylor has performed a number of additional roles in the College including Key Stage 3 Co-ordinator and Curriculum Co-ordinator; it is this wealth of experience, coupled with a strong rapport with the student body, that gives the College such confidence in the appointment. He was the unanimous choice of the interview panel, and the Board of Governors sends its congratulations and best wishes as he assumes his new role.